Home WORLD Cooking a Steak Using Only Solar Power With The Solar Scorcher! 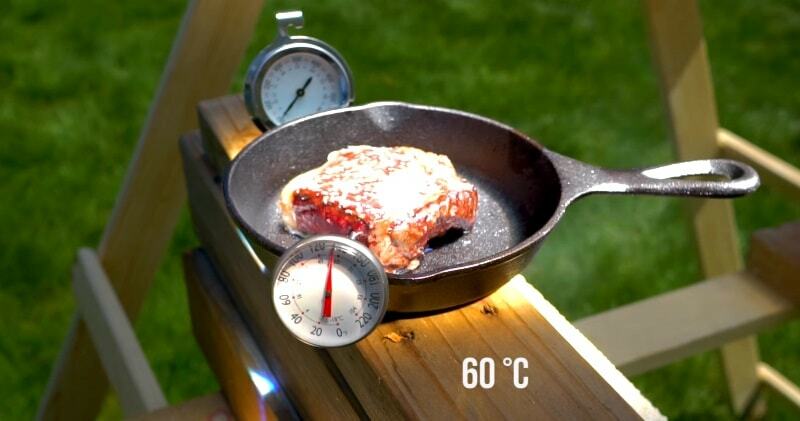 Cooking a Steak Using Only Solar Power With The Solar Scorcher! This is effectively a 4 foot magnifying lens that concentrates insane amounts of heat from the sun. What would you do with all this free solar power?Cooking STEAK with Sunlight.! !Using stoves and ovens, we can cook foods like meat, vegetables, beans, rice, bread and fruit in just about any way. We can bake, stew, steam, fry and braise. Using a solar cooker, we can do the same things, but by using sunlight instead of gas or electricity.This solar cooker can reach temperatures as high as 250º Fahrenheit (121º Celcius). Cooks use ovens to raise the temperature of food in order to eliminate harmful bacteria. For example, most meats need to reach an internal temperature between 145-165º Fahrenheit (about 63-74º Celcius) in order to be safe to eat. Sunlight isn’t hot in and of itself. It’s just radiation, or light waves — basically energy generated by fluctuating electric and magnetic fields. It feels warm on your skin, but that’s because of what happens when those light waves hit the molecules in your skin. This interaction is similar to the concept that makes one form of solar cooker, the box cooker, generate high temperatures from sunlight.